Ftage is a highly customizable WordPress theme. It was made by an exceptionally talented professional for making modern, elegant and interactive websites. Ftage is a multi-purpose WordPress theme; you can use it to make websites without the need to know to the program. It is extremely user-friendly and is well documented. So now you can make your perfect movie production website, film studio website, film agency website, film campaign website, actor/actress portfolio website, etc. All this is possible because Ftage is a versatile and robust WordPress theme. It has a ton of features that make it unique which includes flexible page and post options, different types of the header – full-width header, transparent header, sticky header, and different types of footer – one column, two columns, three columns, and four columns. It has different types of menu – primary menu, dropdown menu, sticky menu, mobile menu, etc. Ftage is a creative and modern design which has 14+ different homepages with a light version and also a dark version. Ftage supports WPML which means your website now can be in multi-language formats. It also has an Elementor drag n drop section builder with 15+ Elementor addons. It is 100% responsive and has 30+ shortcodes. Ftage also has Google Fonts, Icofont icons, Font awesome icons, etc. Ftage supports both full-width layout and box width layout. It supports essential plugins like Yoast SEO, bbpress, contact form 7, mail chimp support, Google Analytics, etc. It is also SEO friendly and cross-browser compatible. This means you get the best results in search engines like Google and your website ranks properly in different search engines. Ftage is highly customizable in hundreds of ways, which means you can have your desired design of unique individual pages be it about page, services page or a gallery. You can also individually customize each section of each page until you are truly satisfied that your design requirements are fulfilled. Ftage was built by a professional team who took the hard work of building a beautiful website from you. This means each and every pixel of the website is hand-coded with HTML5 and CSS3, so you do not need to know programming as you build your own clean and modern looking website with this theme. Ftage understands that films are timeless stories so it has built-in sections like latest trailers and gallery in its homepage, so your products will always get to be showcased at the right place without disturbing the aesthetic element of your desired design. When it comes to film production websites Ftage is exceptionally aware that you need different sections on your home page where you can showcase your desired products, so it has sections like latest movies, upcoming movies, Latest news where news about your movies or actors and actresses can appear. Whereas if you want to build a film agency with Ftage premium quality WordPress theme, then rest assured it has different sections like about us, latest gallery, etc. 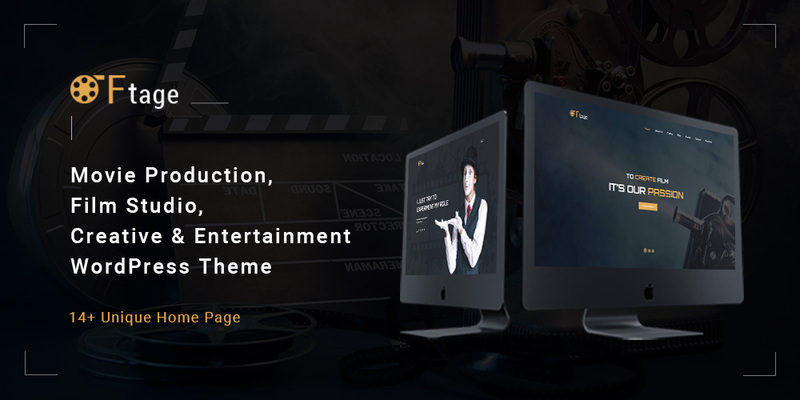 Whatever website you build, be it movie production or portfolio website of an actor or actress rest assured you will have the perfect set of tools that you need in this Ftage WordPress theme. Ftage is also a great theme to make a film campaign website, where you will find sections like the count down timer, sections about the movie, sections about upcoming campaigns, news section about the film campaign stages, film trailer section, etc. It also has a built-in full-width gallery page with different categories like location, production, shooting, studio, etc. Ftage also has a built-in pricing page with customizable options like basic, super saver, express, etc. where you can sell your movies and other movie-related products or services. If you want to build an actor portfolio website it has sections where you can showcase your works and also sections like recent news where you can put news that fans will be able to come and read about. Ftage is a beautiful WordPress theme which was built to make your movie or film-related website easy to build. That is why Ftage also has a wonderful set of essential features and plugins which will ensure that you have the right tools for a perfect website. Ftage was built keeping in mind that you need to prominently showcase your products or works of art when you build your film studio website or creative and entertainment website. So it has built-in features which allow you to perfectly showcase your products and services. When it comes to making the perfect website for your film studio whatever may be your requirement Ftage has it. Ftage is now more easily affordable because there is a limited time 50% discount going on. It comes with a regular license fee of just USD 29 with a 6 months support from HasTech.